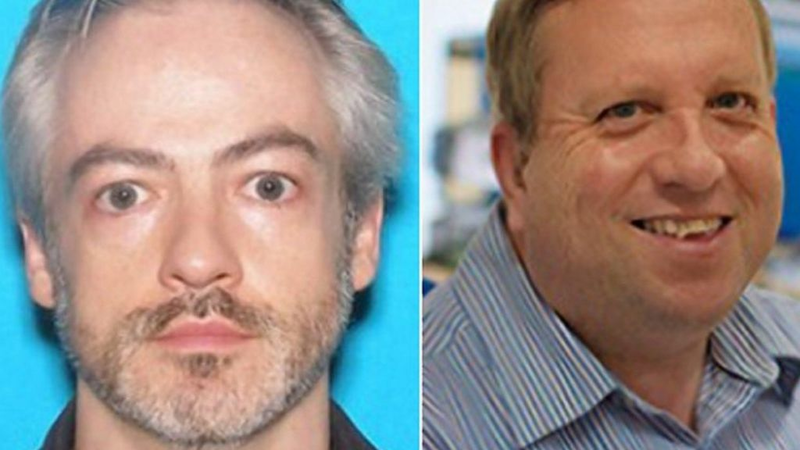 An Oxford University employee and a US professor suspected of killing a man in Chicago have handed themselves in. Somerville College senior treasury assistant Andrew Warren, 56, handed himself in nearly 2,000 miles away in San Francisco while Prof Wyndham Lathem, 42, gave himself up in Oakland. The pair have been accused of fatally stabbing Trenton Cornell-Duranleau, 26, in Mr Lathem’s Chicago flat on 27 July. The killing triggered a US-wide manhunt for the suspects. Mr Warren and Mr Lathem are due in separate courts in California in the coming days where authorities will seek to have them transferred to Chicago. Chicago Police Department (CPD) spokesman Anthony Guglielmi tweeted that both suspects were now in police custody in Oakland. Wyndham Lathem is a microbiology professor at Northwestern University in Illinois, who specialises in the bacteria that caused the bubonic plague. He sent family and friends a video in which he apologised, police said. Supervisory deputy US Marshall Frank Conroy said Mr Warren had handed himself into a police station in San Francisco, while Mr Lathem gave himself up in Oakland. A Thames Valley Police spokesman said Mr Warren was reported missing on 25 July having left the UK the day before. Oxford University said it had been in contact with police in the UK about Mr Warren and was “ready to help the US investigating authorities in any way they need”.